I have never liked the rhetorical politics of Arvind Kejriwal. In fact the seed that they sow in 2011 resulted in the fascist take over of this country. Kejriwal wanted the country to become a gram panchayat at the Ramleela maidan and decisions were taken on the voice vote. All the power elite of the upper caste suddenly turned revolutionary. The patrakars, babus, professional activists, academics, lawyers, suddenly found that there is a ‘space’ for them to grab in the political parties. Anna Hazare wanted to be a ‘Gandhi’ while Kejriwal carefully was moving to fulfil his nurtured ambition. Though for a shorter period, media was even looking for him as Prime Minister of India, a new ‘revolutionary’ leader but we all know the damage was done. Modi was not Manmohan Singh and that is the thing. It is RSS that planted Aap but it went out of their hand because they had tested the popularity. There is not a big difference between the AAP cader and that of the BJP RSS. AAP became a party on a platform that was called India Against Corruption funded by the corrupt elite of this country whose sympathy were first towards the Sangh Parivar. AAP was mandated to run the Delhi government and it was huge, perhaps one of the biggest one. But it is also a fact that Narendra Modi government did not want it to function independently. It was humiliated and files were not being cleared. The Delhi chief minister along with his other ministers were sitting on Dharna at the Lt Governor’s house but he refuse to meet them. While we may disagree the politics of AAP but we have to acknowledge several factors. AAP has put tremendous pressure on political leaders to make their polity pro people but it also helped to create a golden halo around Narenda Modi, who is not bothered about people. He preach, pontificate and refuse to speak to common people but that is how Hindutvavadis would like him. They will criticise everyone else but Modi is their demigod. For Modi, it is easier to fight against Congress as Rahul Gandhi will be accused of 60 years rule, dynasty and so many things which he may not be responsible, but Modi cant really face Arvind Kejriwal who is perhaps more vociferous than Modi and can trash him on any given day. Those who want Modi Rahul debate live on TV should ask for Modi-Kejriwal debate or Modi-Lalu, Modi Mamta, Modi-Tejasvi or Modi-Akhilesh Yadav debate. Rahul Gandhi came to politics from a elite back ground and it has a plus point and a negative as he might not be too familiar with Sadak kee politics which these are expert in. Another plus is that Modi cant accuse Kejri of dynasty or even a bad administrator. I think two modules of Delhi government need to be appreciated in the past few years. They are, the attempt to improve the schooling and make it accessible to students from poor background and second the Mohalla clinic which is definitely appreciable. Aam Aadmi Party has a solid network of dedicated activists and that is why it is still able to hold Delhi at any point of time. Congress unfortunately neither have these kind of activists who can stall Delhi for a day. The silence on part of Congress Party to the whole issue of the governance of Delhi is damaging. Rahul Gandhi should have issued a statement related to the issue of democratic right of a government to function. He may not agree and should not agree with AAP but he should clearly stand for democracy. Congress can not be selective in its approach. 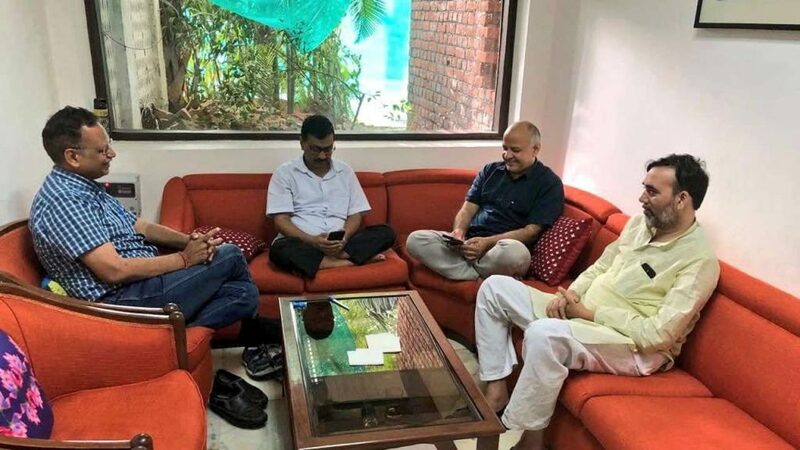 We all agree that Arvind Kejriwal has not done many things to be liked by all and the biggest damage is the current regime which is highly undemocratic but in politics we learn from the mistakes also and on certain issues speak on the issue and not individuals. If Congress had supported the Kejriwal Dharna against the undemocratic way of handling by the central government, it would have helped them gain some respect. They have isolated themselves. It is true that Modi government has demolished all the institutions. It is strange to see that Congress treating it Kejriwal’s equations with the IAS lobby. I cant believe that a chief minister will beat up the chief secretary. This is utterly farcical. The Modi government has muzzled the bureaucracy and make it surrendered, changing its ideological positions but we have not heard a single press conference or a statement against unwanted and undue interferences by the government. We had all wanted that bureaucracy and other related services like IFS and IPS must remain under political control but without interfering in their working pattern or trying to instill communal ideology. That makes India in sharp contrast with America where even the intelligence agencies are independent and investigating the Russian link of President Trump. Congress should not have ignored the plight of its chief minister V Narayanswamy in Pondicherry who is being humiliated by the Lt governor Kiran Bedi who could not win a single election and have still a grudge for not being able to become chief minister of Delhi. Kiran Bedi has not allowed an elected government to function independently. It is surprising that Congress remain quiet on the Puducherry issue which is almost same as that of Delhi as both the state are Union territories. The crisis in Delhi is bigger in nature and about the issue federal structure of our country. Will an elected government be allowed to work independently or not ? Should a chief minister function under the stooge of Central government or work independently ? Long ago many political parties wanted the post of governors should be abrogated as it is a useless position wasting millions of rupees in their ‘shan-shaukat’. Just abolish them and ask them to live in smaller houses. Our democracy can not be an instrument to strengthen the feudal system but it is happening to ‘revive’ the fortunes of ‘dedicated’ cadres who can’t be taken as ministers but can be placed to disturb the elected governments from working independently. The center must initiate the process and allow the government to function. Arvind Kejriwal is good with his cader. His popularity was shrinking but this incident has provided him an opportunity to revive his clout or jadu as his bhakt say. Modi has not brought any positive values to him with this episode. In fact, Delhi’s protest in 2012 and 2013 became the reason of the downfall of the Man Mohan Singh government. We blamed Arvind Kejriwal for bringing Modi. Will he paying his debt now by becoming instrumental in downfall of the Modi government in 2019 ? It looks possible given the nature political parties reacting to his Dharna. Congress should show magnanimity as well as statesmanship that the issue here in Delhi is not personal but autonomy of the institution. Do they support the autonomy of the institution of the Chief Minister or not ? Arvind Kejriwal may have misbehaved with Chief Secretary or the viceversa and an investigation can be done for that but people of Delhi can not be allowed to suffer due to this. Let Congress rise above the narrow partisan interests and strengthen the forces opposing BJP and its vicious communal agenda to defeat them in 2019. Delhi will rise up again and ignite the people’s movement against onslaught on our autonomous institutions including the federal structure of the country. Some time, a small defeat help you win the bigger cause. Congress must learn that as it has bigger responsibility to unite all the opposition parties and defeat the BJP. Will it be able to rise up from its narrow partisan interest ?